LinkedIn has recently updated the web app's interface. 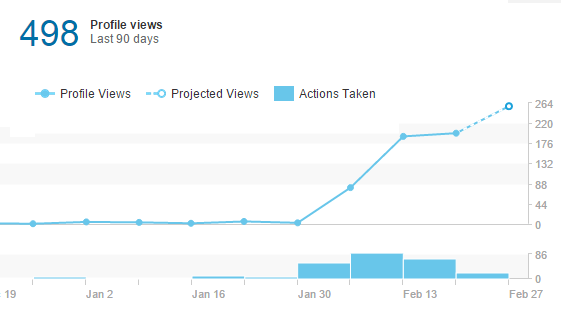 I am using a Premium account and used to be able to see a chart with the weekly Profile Views count (see example from the web attached). Now with the new interface, LinkedIn displays a list of people who have seen my profile (Who Your Viewers Are) but I can't find the weekly or monthly profile count that used to be displayed in a chart. Where can I find that feature? Option to see LinkedIn profile views also exists in free version. You can find the trend chart at https://www.linkedin.com/me/profile-views/ Make sure you are logged in first. Can I get a “network graph” of my LinkedIn connections? How can I change the language in my LinkedIn profile? How do I add only a subset of new endorsed skills to my LinkedIn profile? Where can I see the original message from an approved LinkedIn invitation to connect?